What is #8TerribleTitles you might ask? Well it's a blog hop that all started when fellow Sweet Sixteen's debut author, Kathy MacMillan - and the rest of us Sixteen admins - had a funny conversation around book titles...which resulted in some pretty hilarious conversations. Now I've been tagged by fellow Sweet Sixteen debut author, Kali Wallace to share my own #8TerribleTitles. Scroll through your manuscript without looking and stop at a random place. Look at where your cursor lands and select the phrase it’s on -- this is title #1. Repeat this seven more times for a total of #8TerribleTitles. 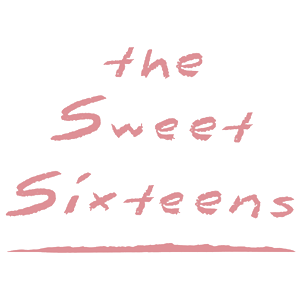 And because a blog hop is like herpes, the gift that keeps on giving -- I've tagged the following Sweet Sixteen's to share their #8TerribleTitles: Jenny Moyer, Ashley Herring Blake, and Kiersi Burkhart!